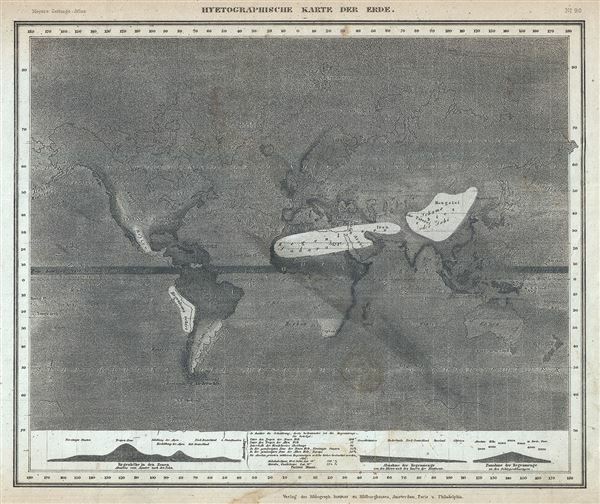 This is a scarce 1852 hydrology map or chart of the world by Joseph Meyer. It depicts the precipitation throughout the world with darker areas are regions that receive more rainfall while lighter areas are deserts. Additional data regarding the increase and decrease of rainfall is included along the bottom border. This map was issued as plate no. 90 in Meyer's Zeitung Atlas. Although all the maps in this atlas are not individually dated, the title page and maps were often updated while the imprint with the date was not, causing confusion to the exact date for some of the maps. Moreover some maps in the atlas were taped in at a later date as an update to the atlas. We have dated the maps in this collection to the best of our ability. Very good. Minor spotting at places, especially near lower quadrants and over bottom margin. Overall age toning. Blank on verso.